One of the best features of CNC technology is that it lets us work on other things while the machine is running. Unfortunately for me that often means using my computer which is running the machine. The solution was to attach the cheapest tablet I could find on amazon with a USB port permanently to the frame. Ground Control supports multi touch and works well on a tablet. Files can be easily sent to the machine using dropbox. While the particular tablet I am using is pretty disappointing (it was the cheapest), the experience of using a tablet to control the machine has been fantastic. 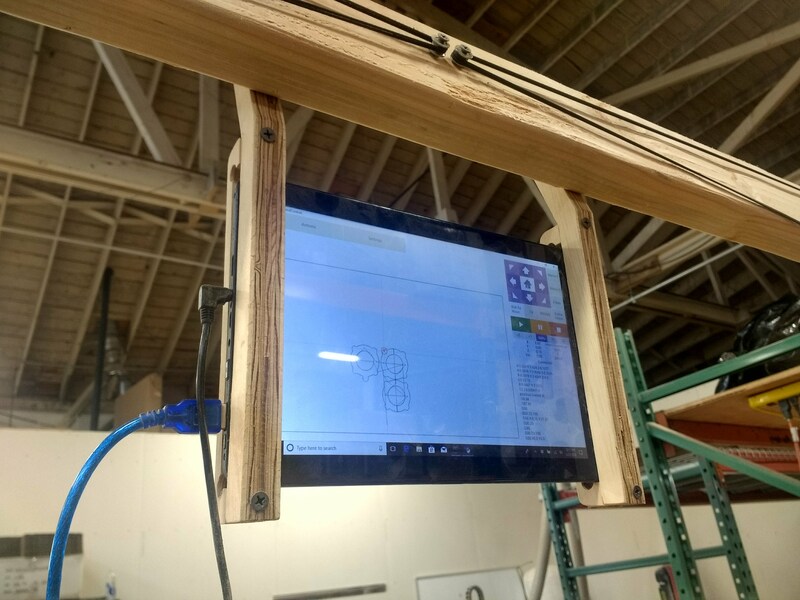 This download includes both the 3D cad files which can be modified to work with a different tablet, and the 2D drawing files ready to generate gcode from. If you want to modify the files, the original OnShape document here is probably the easiest way to do that. The tablet holder could be cut in one piece, but by having the back screw to the front it can accommodate tablets of different thicknesses and ensures a snug fit. The two halves of the tablet holder are attached using 1 inch wood screws. The same screws are used to attach the tablet holder to the frame of the machine. Be sure to pre-drill the screw holes to prevent the plywood from splitting. My tablet holder was made with 3/4 inch plywood and held together with one inch screws. The tablet it is designed to hold is this RCA Cambio. I wouldn't recommend buying that exact one because there are chaper and newer versions available now, but it does work well.